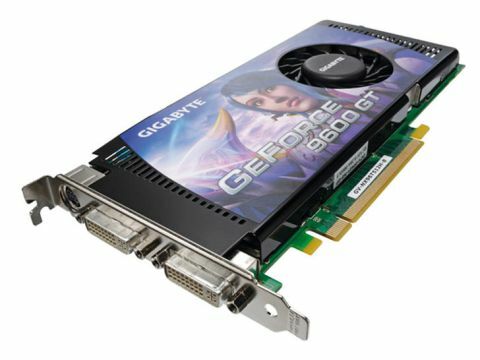 It's time to look at Gigabyte's entry, a bog-standard 9600GT. And while it doesn't quite match some rival cards in terms of performance, it's still a contender. The GPU clock is only 50MHz lower than the overclocked Palit 9600GT Sonic offering, but it's the memory speed that really takes a hit - dropping from 2GHz down to 1.8GHz. Crysis and 3DMark06 both clocked impressive results, but couldn't match other rival card's raw performance, with 3DMark06 dropping significantly, and inevitably a low frame rate in Crysis. The price tag is roughly the same on both cards, and while there's only a few quid in it, it's still bad news for Gigabyte's card.